HomeNew BikesBike NewsHonda CB Shine Vs CB Shine SP: What’s the Difference? The Honda CB Shine is one of the best selling bikes in the country. And if that wasn’t enough, the Japanese two-wheeler manufacturer introduced a slightly more premium variant called the Shine SP to further boost sales. Although the duo shares the same underpinnings, they do differ in some aspects. Here’s everything you need to know to differentiate the two. The Honda CB Shine’s uncluttered design isn’t a head turner by any means, and it isn’t supposed to be as the bike is styled to appeal to the masses. As a result, functionality takes priority over form. However, there are those who prefer the workings on the CB Shine but fancy a little more oomph in terms of styling. For that reason, Honda introduced the CB Shine SP, a premium and sporty alternative to the standard model. While the standard model features chrome elements over its elementary design for a premium feel, the SP gets sharper styling and blacked out components which add to its sporty character. The latter also gets split five-spoke alloy wheels and tank shrouds while the former makes do with a simple five-spoke design for its alloys and misses out on tank extensions. In terms of features, the standard variant features Honda’s patented Combi Brake System (CBS), an analogue instrument console, chrome components and tubeless tyres. On the contrary, the CB Shine 125 SP comes with a semi-digital instrument console with a service due indicator and clock, CBS and low rolling resistance tyres, which improves fuel efficiency. Both bikes share the same BSIV-compliant, 124.73cc, single-cylinder, air-cooled motor that produces 10.3PS of power and 10.3Nm of torque. The motor comes mated to a 5-speed transmission on the CB Shine SP, whereas the standard model features a 4-speed unit. Given that it packs Honda’s HET technology which aids fuel efficiency, a 10.5-litre fuel tank should be good enough to go the distance. Both bikes share the same underpinnings as well. Suspension duties are handled by conventional telescopic forks and a twin shock set up at the rear with 5-step adjustability. Anchoring the bikes is a single 240mm disc brake up front and a 130mm drum unit at the rear. Tyres sizes for either of the bikes measure in at 80/100-18 at the front and rear. The CB Shine Disc with CBS is priced at Rs 62,903 while the Shine SP commands a premium of around Rs 4,800 for the top-end variant equipped with a front disc and CBS. 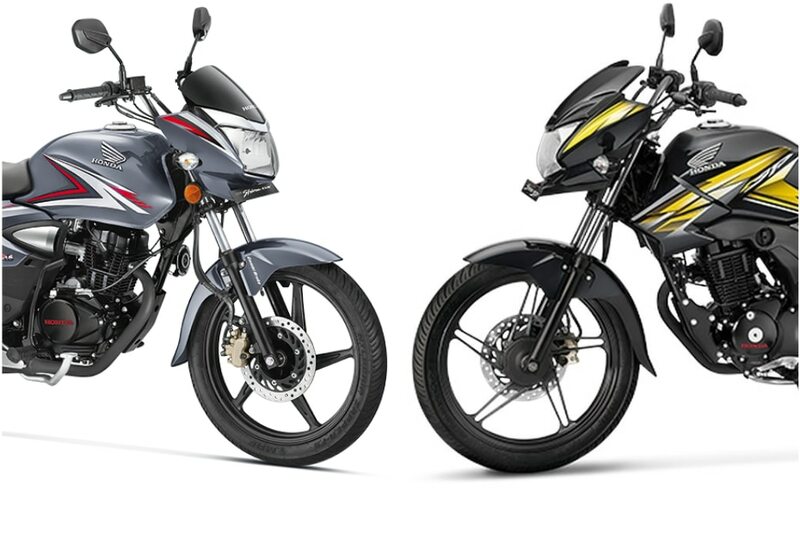 At this price point, both bikes compete with the Bajaj V12 (Rs 58,458), Yamaha Saluto (Rs 60,500) and Hero Glamour Fi (Rs 66,700). All prices, ex-showroom, Delhi.